mutimineral amino acid blend ( providing calcium carbonate, magnesium oxide, ferrous sulphate, zinc oxide, manganese carbonate, copper sulphate, potassium iodide, sodium selenite, chromium chloride, sodium molybdate complexed with citric acid, glycine, rice flour, rice protein complex, sodium hydroxide, sodium citrate, aspartic acid and maltodextrin), bulking agent: microcrystalline cellulose, di-calcium phosphate, ascorbic acid, nicotinamide, tocopherol (soya), biotin, magnesium stearate, croscarmellose sodium, lutein, calcium pantothenate, beta-carotene, pyridoxine HCI, thiamin, riboflavin, hydroxypropylmethylcellulose, vitamin D3 (with arabic gum, tocopherol, tri-calcium phosphate), folic acid, vitamin B12, methyl cellulose, glazing agent: hydroxypropylmethylcellulose, titanium dioxide, stearic acid, microcrystalline cellulose. 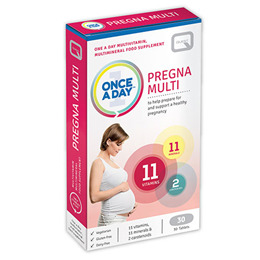 Below are reviews of Quest Once a Day - Pregna Multi - 30 Tablets by bodykind customers. If you have tried this product we'd love to hear what you think so please leave a review. 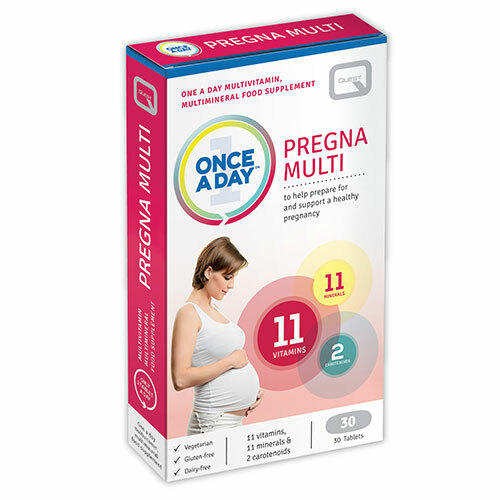 Quest Once a Day - Pregna Multi is a high potency comprehensive formula for women planning a pregnancy, pregnant women and lactating women. It contains amino acid chelated minerals to maximise absorption.